The classical architect William Heyer has been named adjunct professor of Fine Arts at the Pontifical College Josephinum beginning in the Fall of 2010. Heyer will teach a course on sacred architecture, “Sacred Architecture in the Life of the Church”, which will "[explore] the origins and growth of Catholic architecture through the ages, the language and expression of Christian architecture, and the difficulties of Catholic artistic expression and understanding in the contemporary world. Included will be a look at ancient and modern philosophies of Beauty, architectural treatises, Church writings, and modern criticism. Students should be prepared to discuss issues and controversies in Church art and architecture during classes... students will look at some practical aspects of dealing with church architecture. Field trips local Catholic churches will introduce students to issues of building maintenance, restoration, liturgical/interior design, building committees, etc." The course objective is to "introduce students to the rich patrimony of Christian sacred architecture, its context and meaning, and to explore aesthetic and constructional issues in sacred architecture today." The texts which will be used for the course include The Spirit of the Liturgy by then Joseph Cardinal Ratzinger. 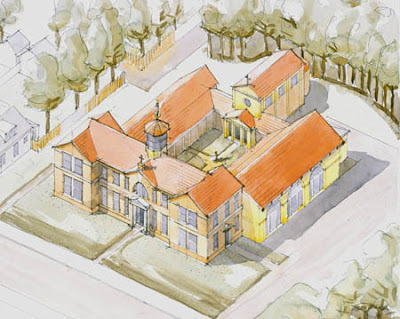 To see some of William Heyer's Architectural work, please see here and here.